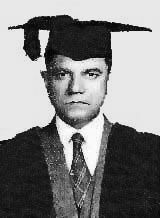 During my time at school (1936-1946) his main function was administrative. He was also Vicar of St. Paul’s Church. 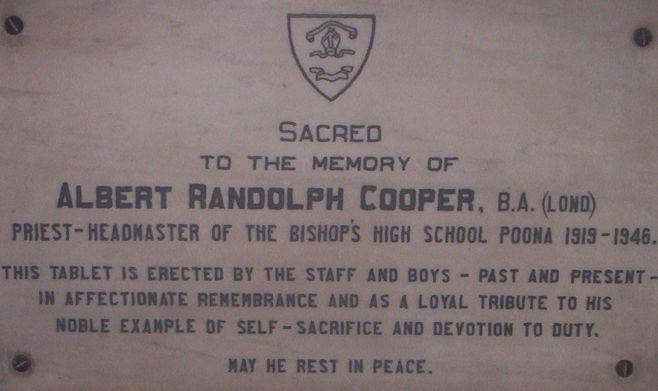 Mrs.Cooper taught mainly in the Senior school. At this time the students were divided into Forms.The lowest class was Form 1 and the Senior Class was Form V1, altogether with subdivisions, nine classes. The Head encouraged all types of sport, both Inter School and School/Army sport. Inter House activities were well organized. He was a Cricket Cambridge Blue and would frequently coach and encourage the boys at nets. If a First X1 boy scored fifty or more in any match he would be presented with a cricket bat at the Annual Prize Giving which was a joint affair with St. Mary’s. Discipline was strict and corporal punishment was common. Masters were allowed to use the ruler on boys’ hands but only the Head could use the cane. In his office he had half as dozen canes and the lampshade above was torn, testifying to the height to which he raised the cane! In truth the awesome experience of being caned was far worse than the actual caning. World War 11 brought major problems for the Headmaster. Several masters (Hartley,Duff, Newing,Giles) left to join the armed forces and staff turnover, during this time was quite high. The government reduced the school grant and in consequence, major cut backs had to be introduced. The Annual Prize Giving was stopped and with it the giving of individual prizes (books,cups,etc. ).The Annual Sports Day held at the Army Sports Ground was also cancelled. However, to aid the war effort, The School Boxing Finals were held at night and tickets were sold to the public. Judges came from the Army Sports Centre in dress uniform and other officials in dress suits and a wonderful, thrilling atmosphere was created. In spite of all the short comings, morale was high and there was a fierce loyalty to The School and the Headmaster, due in no small measure, to his personality and leadership. His aim was to educate his boys in the widest possible sense and equip them to face whatever life sent their way and to this end he succeeded magnificently. Over the last fifty years I have met several Old Boys of my period in school, and without exception they have all had a very high regard for Rev. 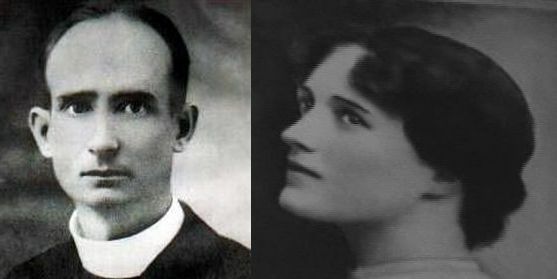 Cooper and Mrs. Cooper. Messers:-D’Sena, Robey,Hunt,Mollan, and Francis, Mrs.Brewin and Mrs. Walker and day staff Mr. Joshi and Mr. Baakza. 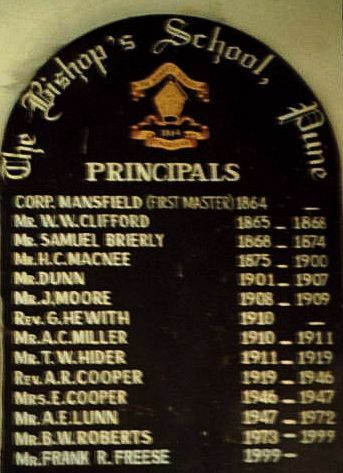 Mr.Lunn took over from Mrs. Cooper , the Acting Principal in the second (June) term of 1947. He took over a School of seven teaching staff and 120 boys. There were approximately sixty boarders spread over three dormitories, Wadia, Jubilee and Yonkers. He set about increasing numbers of both Staff and Students and built upThe School to about eight hundred students and approximately forty Staff, before he retired . During his term of office he introduced the School Song and Hymn Book and restarted the Mitre. He started the Matriculation exam as an alternative choice to the Senior Cambridge, reintroduced School uniforms, made a tremendous impact on sport , revitalized the Scout movement , supervised the establishment of Bishop’s House as a fourth House and generally formalized the operation of The School. To accommodate the large number of boarders he established Service Quarters, Framji Block and Simba House. I think it is true to say that he was the founder of Modern Bishop's. He was genuinely liked by both Staff and Boys and was always very approachable. He kept Open House in the Bungalow and made all welcome He gave me the opportunity to learn my craft as a teacher over 23 years I spent at Bishop’s. and for this I owe him a debt of gratitude. 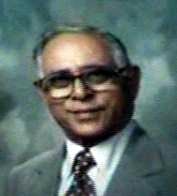 To me he was an excellent leader and a very good friend and we had many happy times together travelling in our car and accompanying the School Bus, the famous “humbug” (so called because it was a bit of Humber ,Ford, Benz ,Chev,and everything else!) on trips to Kashmir , Naini Tal and other destinations with a full load of boys, children, ducks (yes ducks!) and mice and various other animals ! I pay tribute to a Gentleman and a fine Principal. Mr. B.W. 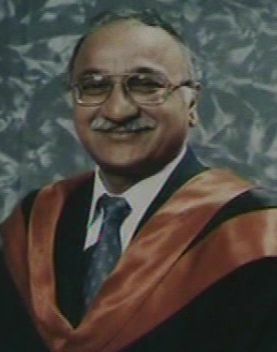 Roberts was appointed Principal in 1973. 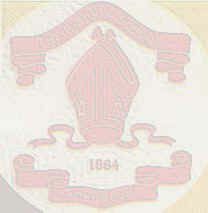 His wife Mrs Lorna Roberts was appointed Head Mistress of the Junior school. Mr. B. Roberts took over from Mr. A. E. Lunn in the year 1973. His wife Mrs L Roberts started the Junior school classes 2 to 4. His 2 daughters Jean and Angela resided with him. He put up many a building to house the growth of Bishopites. There was Lunn block, Junior block and Simba block. To add to the expanse of the grounds the Simba field was levelled off , which was opposite the army police. He then acquired, with great difficulty, the land opposite the main office for further expansion, where he put up an Auditorium and provision for more classes and a new football field with space enough for a proposed Swimming pool. The School grew in numbers and soon was over 3000 students. Staff increased both for the boarding school and on the educational side. 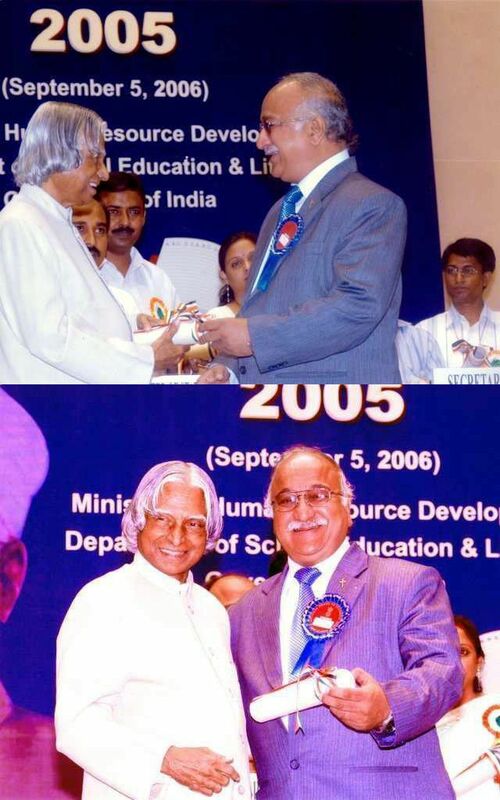 He saw to it that Bishops, rose to great heights and was one of the top schools in Pune. 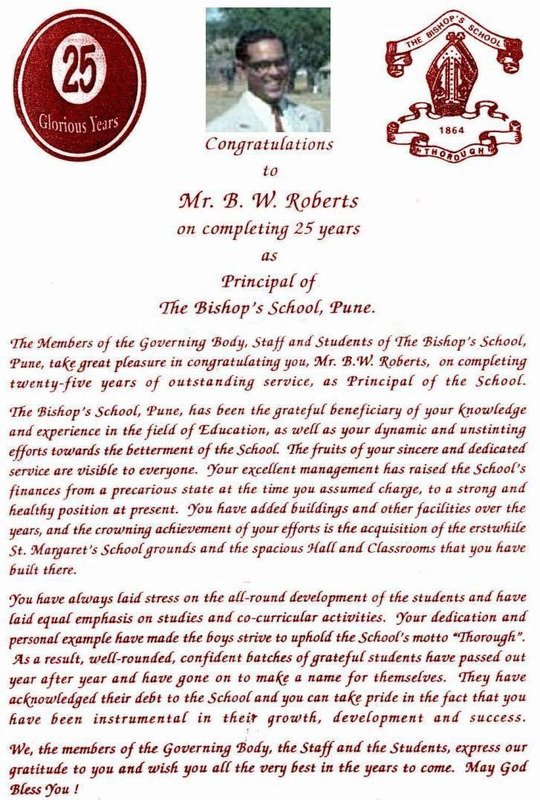 Mr Roberts had a long innings of 26 years and held up the traditions of Bishop's. Mr Roberts retired in 1999 and Mr. F. Freese and his wife were appointed respectively. B W Roberts, Principal of Bishop's School was awarded the Service Excellence Recognition Award (SERA) for vocation excellence at a function held at Blue Diamond recently. The award, instituted by Rotary International, is given to an individual who has excelled in and contributed to his/her chosen vocation. Roberts has been in the field of education for more than 45 years and has been the Principal of Bishop's School for the last 25 years. 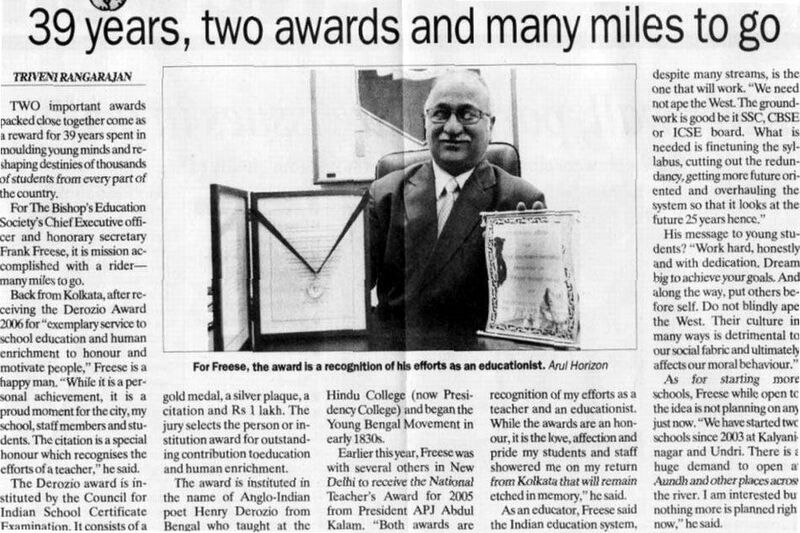 Mr Frank.R.Freese the new Principal guides The School into the 21st century and I am sure he will take his place with the great men who have governed the fortunes of one of the best schools in India so well.